In an unpredictable race, Jarvis (Rockstar Energy Husqvarna Factory Racing) put on a late race charge to take the win by just 41 seconds from Red Bull KTM Factory Racing’s Jonny Walker (GB) with Manuel Lettenbichler (KTM – GER) finishing third. - Under sunny skies and hot temperatures, the 24th edition of the Erzbergrodeo Red Bull Hare Scramble saw the 500 qualified riders blast off the start line at 14.30. 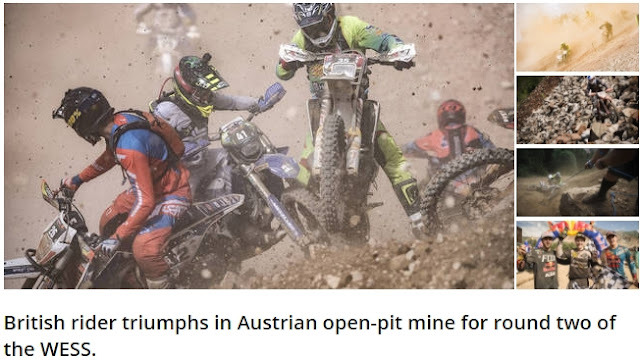 - In total 23 riders completed this year’s Erzbergrodeo Red Bull Hare Scramble within the four-hour allotted race time. - Winner of round two of the World Enduro Super Series, Jarvis also secured his fourth Erzbergrodeo Red Bull Hare Scramble victory. - Finishing just 41 seconds behind, Walker claimed the runner-up result and in turn took control of the WESS championship standings. - Regrouping after the punishing Green Hell section, Lettenbichler was able to cross the finish line three minutes behind Jarvis in third, with Young coming home in fourth. Bolt, seeing his chance of winning lost in Green Hell, completed the top five. - With round two of the World Enduro Super Series now complete, the championship switches disciplines to Classic Enduro, in France at next weekend’s Trèfle Lozérien AMV, June 8-10.